(Bloomberg) -- Cole Haan’s most recent debt offering shows investors will still lend to at least some aging clothing brands. The footwear company is a bright spot in an industry that’s been marred by failures -- Nine West is mired in bankruptcy while Payless is preparing to file for a second time. But Cole Haan, a brand that dates back to 1928 and is now owned by private equity firm Apax Partners LP, has avoided its competitors’ troubles by embracing e-commerce and revamping its products to target millennials and women. Its success is especially notable given the poor record of retailers that borrowed heavily to fund private equity buyouts. The company raised $290 million last week in a term-loan offering that was oversubscribed by investors. The company’s sales climbed 8 percent to $647 million last year, according to people with knowledge of its results who aren’t authorized to speak publicly. Earnings before interest, taxes, depreciation and amortization -- a measure of income known as Ebitda -- rose 38 percent to $84 million. The improved financial metrics allowed the company to obtain lower borrowing costs last week. The performance contrasts sharply with the depressed backdrop for other private equity-owned retailers, many of which have struggled with the elevated debt levels that are characteristic of leveraged buyouts. Higher interest-payment burdens have contributed to a series of retail bankruptcies after the companies had too little financial cushion or leeway to handle shifts in consumer behavior and preferences. Even so, Cole Haan is paying more to borrow now than it did in 2013, when prospects for specialty retailers, especially those backed by private equity, were far brighter. But whereas many junk-rated retailers would struggle to tap debt markets now, Cole Haan borrowed at terms similar to companies in stronger industries. The retail brand saw such overwhelming demand for its loans, it was able to reduce borrowing costs by 50 basis points from the start of syndication. Cole Haan has benefited from having relatively few stores, which allowed it to jump into e-commerce more effectively than their competitors. The New York-based company, now gets almost 30 percent of its North American sales through digital channels -- an attractive selling point for investors. Its prices are higher than many competitors, with most men’s dress shoes costing $200 to $400, while women’s sandals cost more than $100. Cole Haan also sells accessories such as sunglasses, belts and wallets. The company’s wholesale outlets, meanwhile, include online Amazon.com Inc. and the upscale department store chain Nordstrom Inc. High demand for Cole Haan products also means its sales are increasingly at full price, which pumps up margins. “They were able to survive through the secular changes in U.S. retail because they had good products and they invested in the digital channel early,” said Mariola Borysiak, director of the consumer products team at S&P Global Ratings. As a result, demand from loan investors proved higher than the debt being offered by Cole Haan, which replaced the term loan that was minted in the early days following a leveraged buyout by Apax in 2013. The new deal pushes out the maturity of the term loan by five years to 2025. The robust demand allowed Cole Haan to reduce its borrowing cost from initial syndication terms. In return for lower pricing, loan investors pushed for stronger covenants, including quarterly management updates and annual calls. A couple years ago, it wasn’t clear whether Cole Haan would avoid the missteps that plagued its rivals. After being sold to Apax by Nike Inc. in 2013, the company struggled. 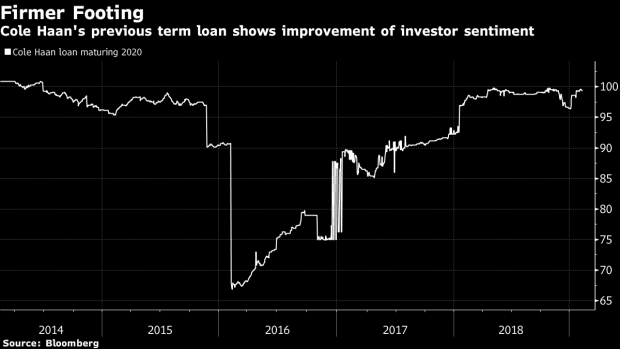 Its old term loan plunged to almost 67 cents on the dollar in early 2016 as competitor casualties piled up amid the so-called Retail Apocalypse. A Moody’s report from the time said that declining financial metrics strained liquidity and sent leverage skyrocketing to seven times Ebitda. Even though the chain is now on more solid ground, analysts caution that earnings growth will likely be more modest. S&P notes that Cole Haan is a small player in highly competitive industry and battles against larger firms like VF Corp. and Tapestry Inc. Nike and Adidas AG may steal away market share as well, while Apax’s ownership may limit the upside for debt investors since the private equity firm may attempt to cash out. “It’s a very volatile segment of retail and the U.S. markets are very saturated,” S&P’s Borysiak said. --With assistance from Lisa Wolfson.